Is it my misperception or does Christy seem to be gaining significant ground on Walter as of late in terms of pre-war card sales lately? In 2008, Eric Seidman wrote a very nice article entitled, "Why Cy ?" The Cy Young award started in 1956. So Seidman went back and statistically analyzed the pre-war greats to get a better fix on dominant pitchers. His results had Walter Johnson winning 8 Cy Young awards, Matty & Grove winning 7 each, G. Alexander nabbing 6 awards, and Cy Young hoisting 4 awards. Seidman thinks it should be called the "Christy Mathewson Award" and rightly so. Then why not the Walter Johnson award? LOL! Perhaps just the WaJo award instead? In reading the article, the author concludes that, "Mathewson was much more dominant than Cy Young during the career of Cy Young". Maybe he was matching up actual year-for-year comparisons. Johnson pitched a little later than both Matty and Young. Answer: 511 career wins, 94 more than the next highest total. 511 wins. Almost 100 more than WaJo and 140 more than Mathewson. Longevity does count for something. Hi Corey! I think it is almost universally agreed that Walter Johnson was the greatest pitcher ever. His ERA is almost half a run better than Young’s. His shutout total dwarfs Young’s. There is an argument for Mathewson, albeit a weak one, but really none for Young. And lemme guess... you polish it daily? I know I would if I had that impressive piece of hardware. Perhaps true Jay, though to some degree it is not an accurate comparison in that Young debuted almost a generation before Johnson, and in order to know what these statistics really mean, one would need to do an analysis of how league pitching stats might have changed over that period. That said, for purposes of creating an award that would resonate with the public, it is a lot simpler to sell a guy that was the all-time win holder with no close second. IMO WaJo is the greatest, but I don’t think it’s entirely fair to penalize Cy for his ERA. During the early part of his career, he had to pitch through a major rule change, when they moved the mound back to its present day 60’ 6”. ERAs understandably shot up league wide. Cleveland’s team ERA increased almost 2 full runs from 1892 to 1893. Cy Young still outperformed the rest of the league in the 1890s, then had an amazing 7-8 year run during the latter part of his career (ERA barely above 2.00) as he approached 40. To the OPs original question, I collect Matty pretty heavily and seem to have noticed an uptick over the past year or so. Not like the WaJo portrait, or the Cobbs, but each of Matty’s T206 poses seem to be creeping up, especially tougher backs. T205, and his many T202s seem pretty strong too. He also received more votes for the Hall of Fame. So, he was seen as the better pitcher during his lifetime. I have always wondered about that. Was it his low World Series ERA? 3 Shutouts in 1905? More team success? Early death? I would take WaJo over Matty. I agree with the article though. I would take Matty over Young. Longevity means something, but not that much. Matty's ERA is a half run better than Young, better than WaJo too, No Dodger fan would take Don Sutton over Sandy Koufax. Tom Glavine wasn't better than Pedro Martinez. Longevity means a lot more than it's getting credit for. I don't know who was best but it's hard to fault the all time win leader for having the award named after him for most wins in a season? Longevity mean A LOT. Young is the greatest pitcher of the era in my opinion, without question, and the award is RIGHTLY named after him. Not sure HOF voting can be used for much of a barometer, or it should be taken at least with a grain of salt. Lou Crigar received 8% of HOF voting in 1937 and Johnny Kling garnered 10% of voting in 1937, both receiving more votes on the 1937 ballot than 31 other eventual HOF members and nobody would argue that either Crigar nor Kling were better than those 31 eventual HOF members. Some of those names include Evers, Chance, Simmons, Roush, Clarke, Crawford, Baker and Gehringer. "in order to know what these statistics really mean, one would need to do an analysis of how league pitching stats might have changed over that period." It's been done. Let's use ERA+ (because it's easy and handy, not because it's the only think you might want to look at). It takes a player's ERA, adjusts it to account for the park he pitched in, and then compares to it league average. 100 is average, higher is better. This allows cross-era comparisons, because if Joe has a 110 ERA+ in 1920 and Mike has a 110 ERA+ in 1950 it means that, relative to his competition, Joe's ERA (after adjustments for his park) was 10% better than league average, and it means the same thing for Mike. Obviously all three were all-time greats, but Matty is a clear #3 in this company. Last edited by nat; 09-20-2018 at 10:02 AM. In Kling’s defense catchers are notoriously under-represented in the HOF, he compares favorably to Ray Schalk and they were both considered the best catchers of their time. On a side note, of the catchers in the 1910-1925 era I have always wondered why Wally Schang never gets any attention... Schalk was the better defensive catcher but Schang was far superior as a hitter. For my money I’d take Schang over Schalk. Disagree. When someone is overwhelming elected it means a lot. Out of 226 voters, with the chance to vote for anyone in baseball's history, Matty had 205 vote for him. That is significant. To put it in prospective, Ruth only got 10 more votes. A guy getting 20 or 16 votes vs. 10 is irrelevant. Matty getting more votes than WaJo doesn't mean he is better, it just means he is one of the greatest pitchers of all time. The next year with the top 5 not taking votes away, Young barely made the cut. He only got 153 votes out of 201 and finished 3rd in voting, behind Lajoie and Speaker (He had finished 8th in 1936 behind Lajoie and Speaker) again. I believe the award was named for Cy Young because he had won the most games at a time when wins were the most important stat. I think today we know better. Jacob deGrom is currently 8-9. By past standards, no one would vote for him because there are several pitchers with 17, 16, 15 wins and winning records. Today, he is a serious candidate to win the Cy Young because we don't value wins, but value ERA, WHIP and adjusting them for things like park, team defense and level of competition. All good points. 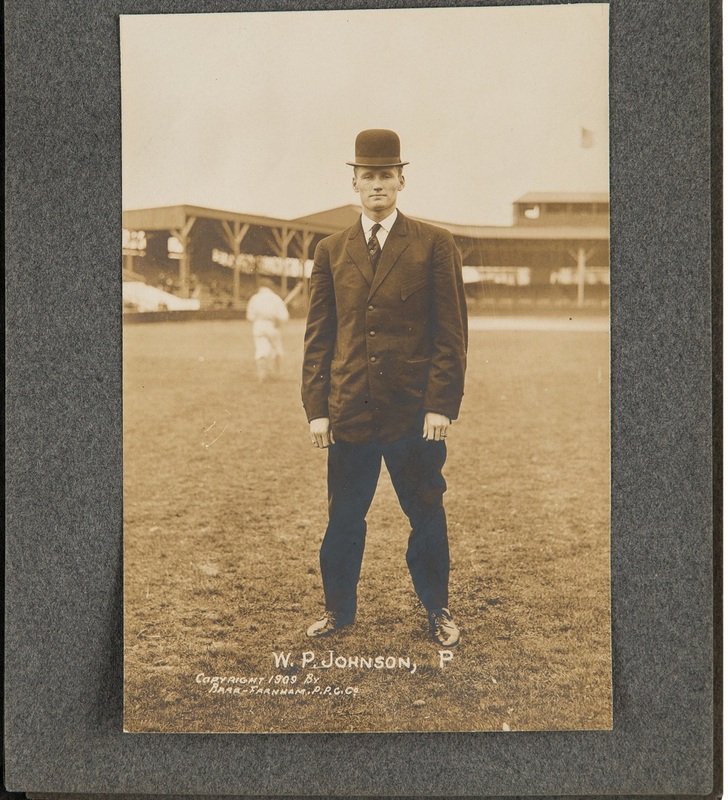 I just think the "Johnson" award would lend itself to more interesting stories: "Here we are in the Astro locker room after Igor Gablowski has won the 2023 Walter Johnson award. Look, there's Igor raising his Johnson above his head. Now he is passing it around so his teammates can take a sip from it ..." admit it, it flows. Cy Young died in 1955, and the award was first given out in 1956. Perhaps it was done more in his memory, despite the fact there were pitchers with arguably better stats. Last edited by barrysloate; 09-20-2018 at 01:08 PM. I would be all for giving it to the season wins leader, but now we give it to a guy who went 13-12 over guys who went- 21-7, 19-6 & 19-9. Why does an award have to be named after the best player (as opposed to a great player, but perhaps not the best)? In 1999, then Commissioner Selig introduced the Hank Aaron award, given to the best hitter in each league. Was Aaron the best hitter of all time? Maybe? There are certainly others who have a case. Someone else mentioned that the Cy Young award came about a year after his death. It was introduced by then Commissioner Frick. I'm pretty certain that Selig thought very highly of Aaron, and I speculate that Frick probably felt similarly to Young, which is very likely why both awards were, in part, created. There is also a name associated with the batting titles: It's the Tony Gwynn Award for the NL, and I believe the Rod Carew Award for the AL (I know they aren't commonly used). Both were exemplary hitters who won multiple batting titles, but nobody would confuse them with Ty Cobb, Babe Ruth, Rogers Hornsby, or Ted Williams. One is not obligated to pick the best player ever to name an award. True dat. Although I don't think that I'm going out on a limb to say that MLB couldn't have done any better picking the right player for the Roberto Clemente Award. The award was named after Cy Young in 1956 not for any of his achievements necessarily, but to commemorate his death the year before, in 1955. ...and the Adam Dunn award goes to...Yoan Moncada!! Last edited by PiratesWS1979; 09-21-2018 at 05:02 PM. to Chris Davis for being the LEAST OFFENSIVE player. Last edited by clydepepper; 09-21-2018 at 05:13 PM. He does lead the majors in something......passed balls. That in itself is an amazing achievement considering he missed over forty games with injuries. I wonder if he is in the lineup for his bat(if the season ended now he would set the record for the lowest Yankee batting average, min 300 AB, EVER) or his glove (see passed ball stat). What’s left—base running? He’s the slowest guy on the team. I agree there is no obligation to name the Most Games Won in a Year Award. It is named what it is because it makes the most sense. And I like Johnson as a collectible, a lot. And he has the nicest grandson on Earth too!! All that and The Big Train could dress too. But it doesn't change the fact (most wins in a lifetime by a lot) on what is the best name for the most wins in a season. And to get back to topic, Johnson has seemed to be collected right above Matty but not by much. And different card issues can easily have Matty going for more. Last edited by Leon; 09-24-2018 at 12:12 PM. I've always thought Walter and Matty were at the same level of collector's appeal, a notch below the big boys: Ruth, Cobb, Jackson, Robinson, who else? Mantle, maybe? Wagner, perhaps a bit because of the T-206 mystique? And that Barr-Farnman postcard is one of the WaJo greats, it was a special treat to see that set in person last year. Any idea what the p.p.c.c. (or o?) stands for? And is it Farnman or Farnham? It is actually a real photo used as a sample to order the postcards. It was a salesman's sample book, at auction, for ordering the postcards... or the photos, actually. This (regular sized but enlarged here) business card should help with the initials. It is on the back page. Last edited by Leon; 09-27-2018 at 06:43 PM. Incredible piece, including the business card. Have you ever had one of the postcards? It was enjoyable and very cool just to witness that spread of information! Great point, except the Cy Young award is not for most wins in a season, it is for the best pitcher. The two are often not synonymous. My mistake, it is best pitcher and not most wins. Blame Gabby, he told me what it was . And the photo album was 2 bucks !! I paid a little more for it so probably overpaid as usual. Boy, did you ever screw up on this one, Leon: you could have had 25 postcards instead for only a buck and a quarter and saved 75 cents. Even better, you could have ordered 25 WaJos and 25 team PCs for just fifty cents more and bought yourself a house a hundred years later! Instead, you're stuck with that stupid photo album! Call me next time, will you? Have never seen one, wonder if any were actually produced. Maybe not. I saw some--perhaps a set--at the Library of Congress many years ago, but those could have been photos, too, the copyright exemplars. I used to have someone else polish mine but she quit a few years ago, so now I am back to doing it myself. Between that and collecting cards I feel like a 13 year old again. Last edited by Exhibitman; 09-28-2018 at 12:53 PM. Walter Johnson is best ever based on stats back then while Nolan Ryan is the best modern pitcher. What amazes me most about Johnson is the 110 shutouts, a record that will never be broken. Second most impressive statistic of his is the 417 wins in spite of losing 63 games in which he allowed only one or two runs.